Personally, I really don’t care for nature in general. I like specific animals and plants. And specific places. I like that weird-looking bird over there. And I care about that specific spot near the lake. You know, the one with the broken bench. Anyway. 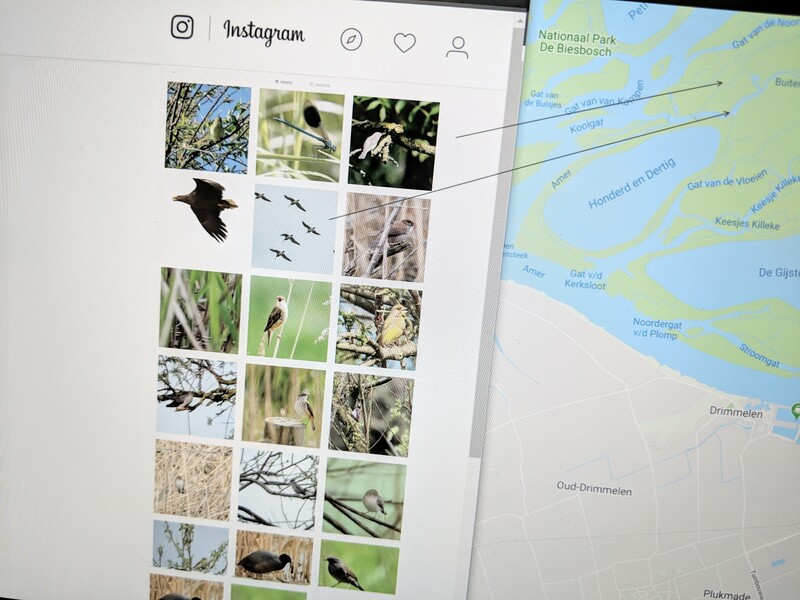 The aim of this project was to conceptualize a system that could create social media-channels devoted to extremely specific locations in nature reserves. It would do this by repurposing the enormous amount of geo-tagged content already online. The set-up would let users subcribe to any spot. New content found online with matching coordinates would be re-posted to the specific feed. It wouldn’t be often you would get to see a photograph someone took at the exact same bench near the lake, but when it would it would be special. Such micro-channels compliment general, ‘hand-made’ feeds (f.e. a foresters Twitter-account or the Facebook of a nature reserve). I constructed a barely-working proof-of-concept where the location of Instagram-posts could be followed like #’s. But, mid-2016, IG imposed strict limitations on the functionality of their API. Twitter still allows localizing tweets, though it comes with restrictions. Also, while Twitter has an enthusiastic birding community, for other nature pics – #treesofinstagram anyone? – it disappoints. There are more useful sources. Twitchers and outdoor enthusiasts upload and tag tons of photos everyday, on sites like eBird and Observation.org. In the Netherlands Waarneming.nl collects a projected 7 million observations, often including photographs, in 2018. The services aggregate data by location and offer useful platforms for appropriating content. The current set-up reposts relevant photos from Waarneming.nl to Instagram.